Everyone likes to talk about Tesla, and lately there’s been plenty to talk about. I just want to talk about one Tesla-related thing today, the rocky tale of the Model X. Lots of people think it was a huge mistake, and maybe they’re right. All I know is that it should have been a van. There’s a lot of reasons why the Model X seems to be a misstep to so many people: there’s chronic quality control issues, it’s overcomplicated, there’s inherent design issues, it was two years late to market, and it still feels like an ungainly, bloated version of the Model S.
Originally, the stated goal of the Model X was to have a true family car in the Tesla lineup. That’s a great goal, and the underlying technology that Tesla uses is fantastic, and should have made an amazing vehicle for families. The problem is, somewhere along the way, Tesla got too ambitious, and the family Tesla became something closer to a background car in a Will Smith movie about a future where robots control the real estate market. Those Falcon doors are cool, absolutely, but they’re expensive and complex and, if we’re honest, do they work any better than, say, a van’s sliding door? Elon Musk and/or Tesla got caught up in a lot of things, including hype and a healthy dose of the anti-van stigma. They designed something that’s closer to a crossover or SUV, and while I expect they did this for design and marketing reasons, I’m not so sure the long hood and sloping roofline are worth the result. Sure, they have a trunk up front, so the packaging is better than an average SUV or crossover, thanks to their skateboard chassis, but what if they played it, ironically, bolder, and just made their family car a full-on van? 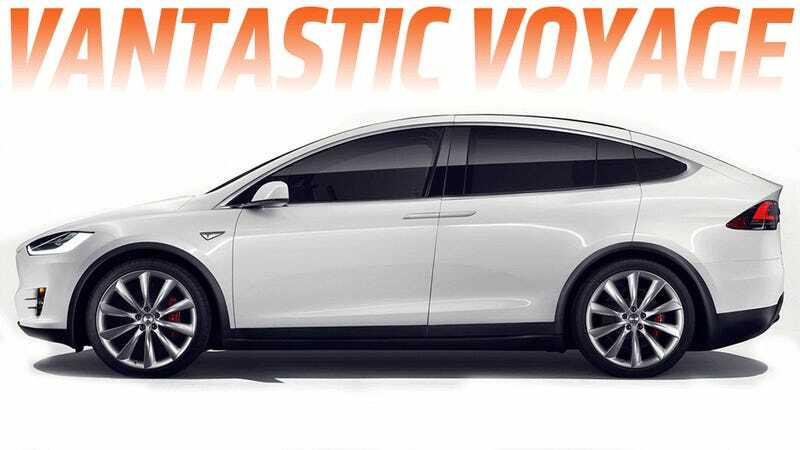 If they had resisted the urge to overcomplicate everything, gotten rid of those articulated doors and double-curve windshield and made a more conventional – but still Tesla-sleek – van body, the Model X could have had a chance to become a more flexible, useful, and successful vehicle. The Model X van would have had conventional van-type sliding doors on both sides. Everybody makes these, in power versions. They’d do pretty much everything those Falcon doors are supposed to do, but with off-the shelf parts and much cheaper. Since the Tesla platform is basically a flat skateboard, a box-like van body would allow for all that space to be used, so there’d be plenty of room for people or cargo. A true van would have allowed for stripped-down, cheaper versions with manual doors and bare interiors for cargo use (electric delivery vehicles make a shitload of sense), or as platforms that could be bought by conversion companies who’d turn them into the first widely-available electric campers, or executive limos (think those Mercedes Sprinter ones), or shuttle vans or whatever. An electric van could have been just the thing to lure all those rich old Boomers who are still holding out for Volkswagen to make that new electric Microbus they never seem to manage to actually build. Electric Tesla Model X vans could have become the coolest food truck platform, the choice of any company that wanted some instant cool and enviro and tech cred. It all comes down to two things: simplicity and flexibility. I have a lot of faith in Tesla’s fundamental technology and their design skills. I’m positive they could design a fantastic-looking van that would fit with their overall design vocabulary. They could have poached some experienced van-builders from Chrysler or Toyota, and leveraged all those years of van-building experience to design a body that they could build without panel gaps the size of creeks. Yeah, it’s probably a little too late, and Elon Musk very likely could not be bothered to donate the most nano-scale of shits about what I think. I get it. But I still think Tesla should cut their losses with the Model X and partner with someone (I think they’ll need all of their factory capacity for the Model 3) to build a nice, simple Tesla van. I kind of want the camper one.